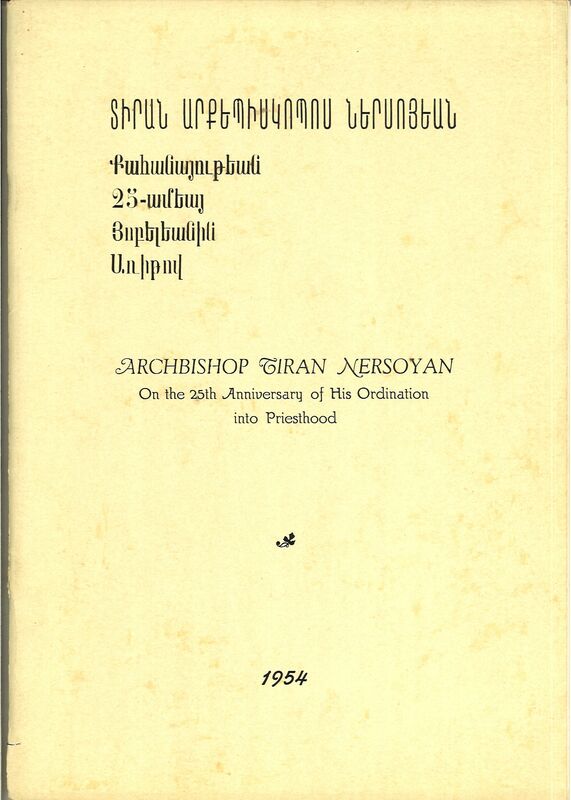 The following remarks of Archbishop Tiran Nersoyan (1904-1989) were published in a commemorative booklet published in 1954 on the 25th Anniversary of his priestly Ordination. The booklet was recently donated to the Zohrab Center. It contains other essays and sermons of the Archbishop along with a biography written by his student, “Very Rev. 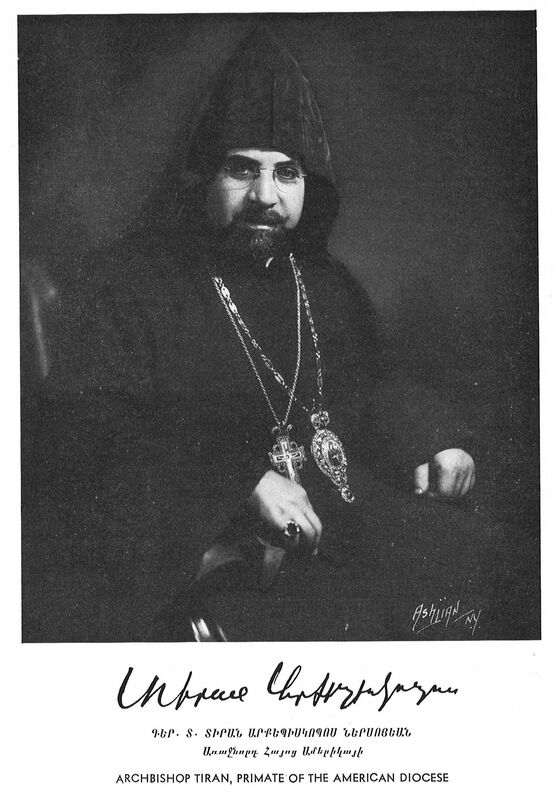 Torkom Manoogian,” the late Primate and Patriarch of Jerusalem. In these excerpts, Tiran Srpazan challenges young Armenian Americans, particularly those in the newly-established ACYOA [Armenian Church Youth Organization] to elevate themselves to the highest ideals of their ancestral church. In so doing he articulates a vision of what it means to be Armenian and American. It is true that there are great numbers of Americans who profess to be religious. Some of these, however, mistake religion for magic. They think that by going through certain ceremonies and thus doing the customary thing, they have done their duty to God. By merely going to church, or by merely having certain ceremonies performed on them, they think their souls will be saved. Others, going to the other extreme, think that by quoting the Bible and drawing all kinds of strange conclusions from those quotations, they will find the way of salvation. We must beware of both these pitfalls. Of course, we can be saved from spiritual death only through the holy sacraments and through the Word of God, but we must subject ourselves to the holy sacraments and to the Word of God in deep discernment, in humility, and in an honest efforts to be changed by God’s grace. It is the gradual change and renewal of our souls that will give us the fuller life, in which we can find happiness, real deep happiness, both in this world and in the life to come. We have had great religious leaders and teachers. By following them, by being faithful to our religious and cultural past, and being faithful to our Church and its precepts, we can live in this country the fuller Christian life. By holding the standard of our faith high and by following dutifully on the path of our forefathers, we can avoid the dangers and the pitfalls to which I made reference a moment ago. 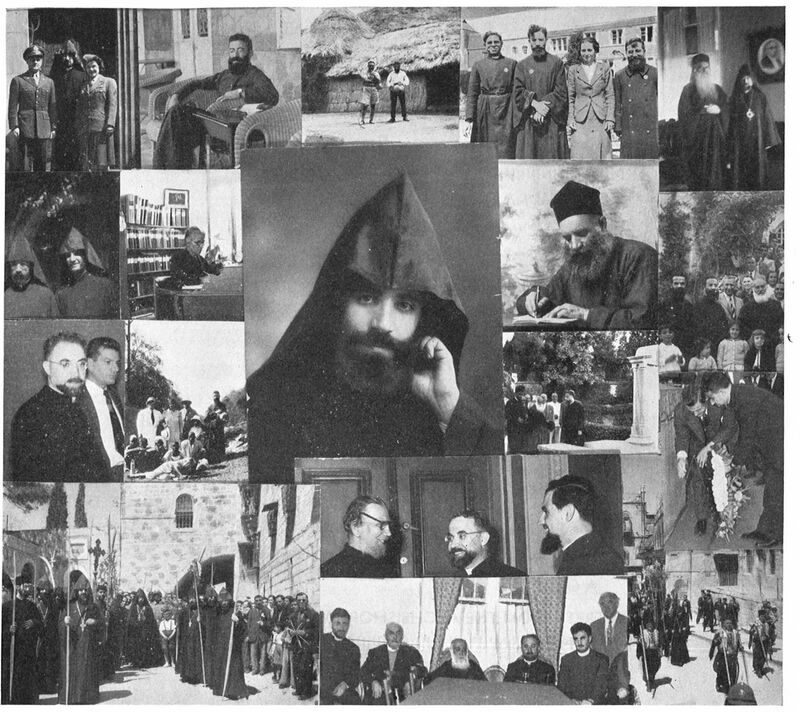 Because the Armenian Orthodox way of Christian living will give us a sound, and realistic spirituality, which is neither merely formal nor merely emotional, but which in a healthy way will make us adjust our lives to the circumstances of modern civilization and, at the same time, will lead us to eternal life and to the Kingdom of God. Not only this, but also, provided we have the necessary missionary zeal, we can spread our good influence around us and thus contribute, in our modest way, to the spiritual enrichment and to the deepening of the faith of America. We can become a fragrant and beautiful flower in the gardens of large and small Christian communities, which together are striving, in their different ways, to cultivate the spiritual soil, or we might say the soul of America. Recently donated to the Zohrab Center, this commemorative booklet published in New York in 1954 contains a comprehensive biography of Abp. Tiran Nersoyan written by his student, the late Abp. Torkom Manoogian. We are living in a young and vigorous country. The freedom we enjoy has made this country great. Our prosperity is proverbial in the whole world. We must use these blessings to good purpose. And good purpose does not mean only pursuit of material comfort and enjoyment: it does not mean only the use of more gadgets for our ease and pleasure. Ultimately only One is Good, and that is God, as the Lord Jesus said. And while our ultimate purpose is to realize God’s will in us and in our society, all intermediate good things must serve and be directed towards the uplifting of our souls to God. It is sad to note that a great many young men and women lack this kind of purposefulness in their lives. They lack intellectual passion. They seem to think of almost nothing but of making money and spending it for common pleasures. They are mostly floaters on the stream of life. They seem to think that the wonderful technical progress of our civilization is all that should engage our attention and activity. In order to bear good fruits, we must all, whether individuals or groups in the Organization, adhere faithfully to the spirit, as well as to the letter of our Constitution. This Constitution was drawn up and adopted, and subsequently amended by the members of our Organization, and we all subscribe to it of our own free will. The freedom of our Organization to direct its own activities is only limited by its own Constitution—freely subscribed to by its own members and executed by its own constituted bodies. This is so, because only in freedom can people assume responsibilities. As long as our members are motivated in their actions by the same holy purposes of their Christian faith and their love for our Mother Church, their freedom will be creative and fruitful. It is that kind of creative and constructive freedom that we want our Organization to have. Subjecting oneself to God’s will is the loftiest and most satisfying way of being free. Because by working with God, we shall partake of God’s own infinite freedom.